R.E.M. announced the release of a limited edition, four LP acoustic set for Record Store Day. The collection includes all the audio from the band's MTV Unplugged episodes in 1991 and 2001, plus 11 songs that never aired as part of the telecasts. R.E.M. 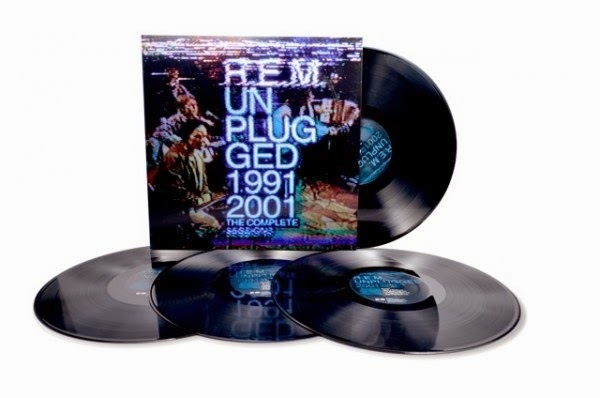 Unplugged: The Complete 1991 and 2001 Sessions will be pressed on vinyl and sold exclusively in limited quantities at select record stores on April 19th, so now would be a great time to start sucking up to your favorite record store. Barring that, a CD and digital album download of the set will be released on May 20th. Check out the tracklisting below and read more about the release here. Watch the trailer for R.E.M. 's Record Store Day offering here. 2. "Disturbance at the Heron House"
1. "Its The End Of The World As We Know It (And I Feel Fine)"
1. "All The Way To Reno (You're Gonna Be a Star)"
1."So. Central Rain (I'm Sorry)"